Part of Acer’s Travel range of beamers – until recently an unheard of category – this lightweight, pocket-sized beamer even manages a 3D mode. 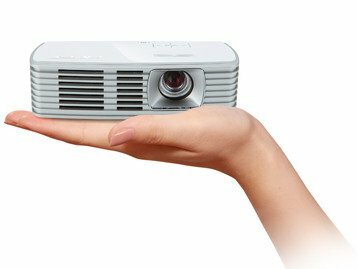 It’s a tad pricer than most small projectors, but the reason, once again, is its brightness. Unlike the sub-100 lumens of most Pico projectors, this one achieves 500 lumens, which does away with the need for a total blackout. Its 1280 x 800 pixel resolution means a 16:10 aspect ratio, which helps make it a decent option for films and laptops. Equipped with a HDMI input that MHL-ready – so able to take a feed from a smartphone or tablet – the K132 has a 1.7x zoom and an impressive contrast ratio of 10,000:1. Don’t expect the brightness of your average TV, nor the play-from-SD-card features a lot of the projectors here include, but the Acer K132’s core strengths of contrast, colour and brightness are hard to ignore.